Built in 1904-1905, the public baths signify progressive reform in America for the immigrant experience in the East Village. Historically, the baths were free to the public, as many tenants in the neighborhood did not have bathroom facilities. 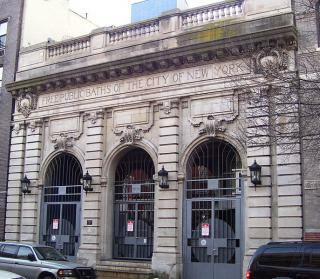 While the bath's closed in 1958, the building was used as a warehouse and garage for the city of New York. In 1995, Pulitzer Prize-winning photographer Eddie Adams bought the historic building and converted it into a high-end fashion and corporate photograph studio.